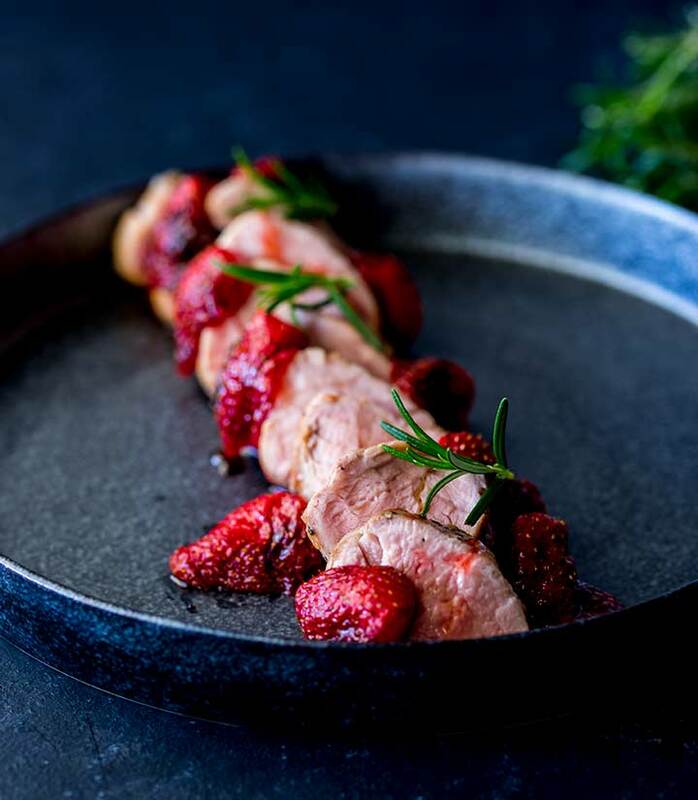 Juicy, tender rosemary pork tenderloin with a surprising and delicious kick of sweet roasted strawberries and a delicate drizzle of strawberry dressing. This pork dinner is gorgeous, elegant and so simple to make. Serve it to guests or impress your loved one with this quick pork dinner date night supper. You can easily scale the recipe up/down using the function on the recipe card. Using the oven, dinner will be on the table in under 30 minutes, with the sous vide machine it will take an hour. What is Pork Tenderloin? And is it the same as Pork Loin? Alternative names: Pork Loin Centre Cut, Centre Cut Pork Roast or New York Pork Roast, Top Loin Pork Roast, Ribeye Roast. Where it’s from: The back of the pig. Size: A typical large roast comes in at 5-8lb (2-5kg) But it can be cut to size for you. Texture: Fairly lean and tender if cooked properly. Alternative names: Pork fillet, Pork Tender. Where it’s from: Tenderloin is the muscle that runs alongside the pigs backbone. Texture: very lean and tender especially if cooked quickly. Flavor: Mild and delicately flavored meat. Wait can pork tenderloin be pink? I promise this is the tenderest pork tenderloin you will ever eat. Cooking it quickly and having the inside medium rare, will reward you with the most delicious and juicy cut of pork. Rosemary Pork Tenderloin with strawberries? That’s a little different. Yes, pork and strawberries is a little bit different but it is so delicious. And pork and fruit is a well trodden path. Pork and Apple, Pork and Cherry, Pork and Pineapple, all delicious fruity pork dishes. The sweet strawberries work well with the mild pork. And the rosemary ties everything together to make this dish truely memorable. What to marinade pork tenderloin in? 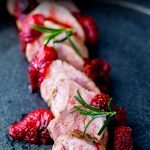 This recipe for rosemary pork tenderloin plays on the sweetness of the strawberries and the herbaceous rosemary. So I like to include plenty of rosemary in the marinade. But in all honesty as long as you season the pork generously you could skip the marinade stage. But the rosemary is perfect here. To marinade pork tenderloin use a simple mixture of olive oil, chopped rosemary, salt and pepper. What oven temperature do you cook the pork tenderloin at? 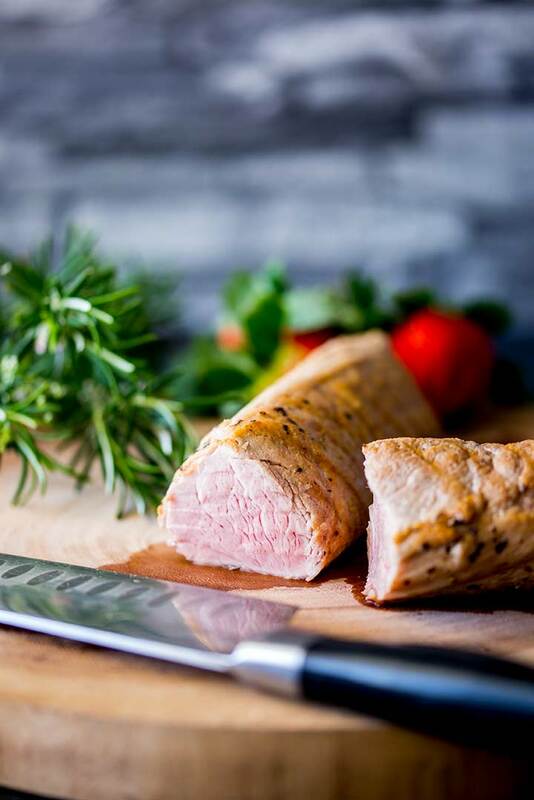 Pork tenderloin is best cooked quickly, so to ensure you get the inside to 145ºF/62ºC by the time you are ready eat it (i.e including resting time) I like to have my oven set at 425ºF/220ºC and cook the pork for 12-15 minutes. Once the pork has cooked, tent it with foil and allow it to rest for 5 minutes. It will continue to cook slightly and the muscles fibres will relax. Can I use the sous vide machine on Pork Tenderloin? Absolutely!!! The sous vide machine was made for cuts like the pork tenderloin!! I set my water bath to 145ºF/62ºC and cook the pork for 1 hour. You can sear the pork before its time in the water bath or after. I prefer before, it makes sealing it in the bag a little harder, but I love how the seared flavor intensifies as it cooks. If you have bought a pork loin rather than a pork tenderloin this rosemary pork tenderloin recipe isn’t going to work in the same way. You can still serve it with the roasted strawberries, but your pork will take a lot longer to cook than the recipe suggests. I would follow this recipe for cooking pork loin from Kelly over at The Anthony Kitchen and then add in my strawberries at the end. Or try this one from the lovely Whitney Bond who loves her sous vide as much as I do. If you have a sous vide machine, then you can cook your pork loin in there but it will take 3 hours rather than the 1 hour that pork tenderloin takes. What kind of wine to serve with Rosemary Pork Tenderloin? Pork is a delicate meat so you want a lighter wine that can still stand up to the sweet strawberries, for me the best pairing here would be a light Pinot Noir, but if you are a white fan then try a fruity Pinot Gris or a toasty unoaked Chardonnay. What to serve with Rosemary Pork Tenderloin? This dish is so beautiful it deserves a beautiful side dish. Pair it with a crisp green salad and a delicious potato dish like my Hedgehog Roasted Potatoes or my Smashed Potatoes (I would swap the thyme in this for rosemary). 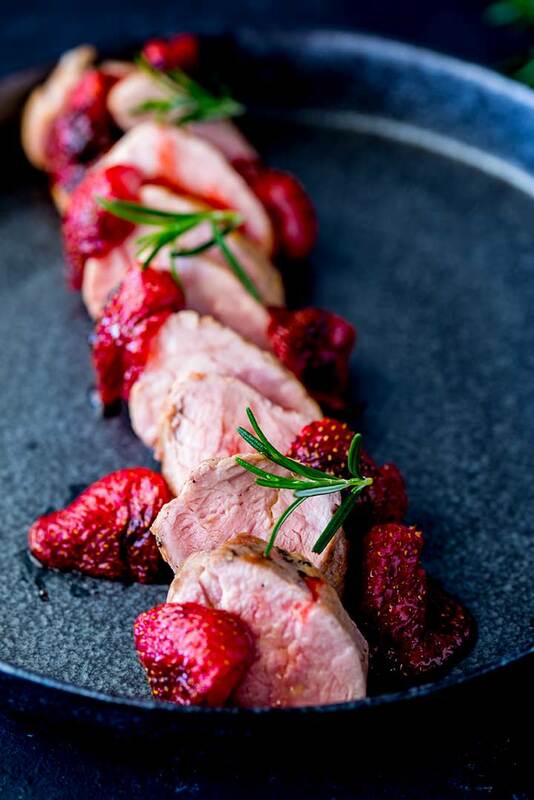 Juicy, tender rosemary pork tenderloin with a surprising and delicious kick of sweet roasted strawberries and a delicate drizzle of vinaigrette. This pork dinner is gorgeous, elegant and so simple to make. Cut any silver skin off the pork tenderloin and discard. Mix the olive oil together with the salt, pepper and chopped rosemary. Place the pork tenderloin in a ziplock bag (or container with a lid) pour over the marinade and then refrigerate for 3 hours or overnight. Place a heavy based oven safe skillet (cast iron is perfect here) over a medium high heat. Add the pork tenderloins and brown on each side for 1 minute as side. Remove the pork from the oven and transfer to a warm plate, tent with foil and leave to rest. If you are cooking your pork this way, roast the strawberries at the same time. Pre-heat your water bath to 62°C/145°F . Remove the pork from the marinade, brushing over any chunks and gently pat dry with kitchen paper towel. Sear the pork in a smoking hot skillet until nicely golden on all sides. Place the pork in your water bath and cook for 60 minutes. Remove from the water bath and let the pork rest for 5 minutes. If you are cooking your pork this way, then you will need to start your strawberries once the pork has had 45 minutes in the sous vide machine. Hull and cut the strawberries in half. Lay them on a lined baking sheet and drizzle with the oil then sprinkle over the sugar and salt. Remove them from the oven and carefully pour the juices off into a small bowl/jug. Reserve this for the dressings. Mix the reserved juices together with the extra virgin olive oil and lemon juice. Whisk well and taste, it should be a little sharp and a little sweet. Add more seasoning as required. Slice the tenderloin into ¾ inch slices and arrange on the plate. Scatter the roasted strawberries around the pork, garnish with some fresh rosemary and drizzle with the dressing. Place the pork in airtight sealable bag, seal it almost all the way along. Submerge it almost all of the way under water, leaving just the unsealed portion of the bag out of the water. The water will push out all of the air from around the pork and you can seal the bag fully closed. 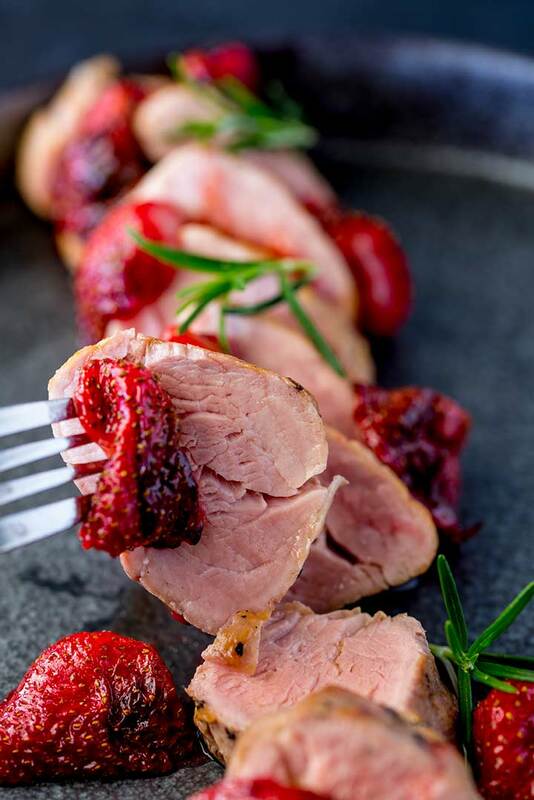 If you love food why not subscribe to my newsletter, I will drop you an email every now and then, just to say hi and send you a couple of recipes I think you might love, like this Rosemary Pork Tenderloin with Roasted Strawberries. This is such a beautiful dish! And thank you for not overcooking the pork. That makes me crazy! Beautiful photos. What a delicious pairing! I don’t think I would have thought of combining strawberries with pork but this just works! I love pork with fruit! Strawberries is a totally new (and delicious) combo for me! There is something about the pork that just works so well with fruit isn’t there. My husband loves pork dishes, and I feel like we don’t make them enough… thank you for sharing this new way to enjoy pork! Wow, this has got my mouth watering! 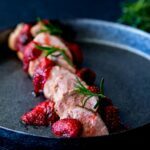 I would never have thought to pair pork tenderloin with roasted strawberries but it sounds absolutely delicious! What a great way to use strawberries. I really need to do them with savoury meals more often. I made this last night and it was so yummy. My boyfriend was very impressed. I oven cooked it as I don’t have a sous vide. Can I grill the pork tenderloin? Pre-heat the grill, then use it at medium-high heat, cook the tenderloin directly on the bars for for about 12-15 minutes. I’d keep the grill covered and turn the loin every 3-4 minutes. Check the internal temp is at 145ºF and then let it rest for at least 5 minutes. This looks so amazingly flavorful! I can’t wait to try the sous vide method!